…consistent evidence shows that all manner of nuts, including walnuts, almonds, hazelnuts, pecans and cashews, promote healthy arteries and cholesterol levels when we consume them in moderation. Eating a small handful of nuts about five times a week is perfect (http://www.wholefoodsmarket.com/recipes/food-guides/nuts-seeds ). Children form their tastes for foods at home, especially in the years before they go to school. A taste for a variety of nuts and seeds can lay the foundation for a longer and healthier lifestyle, and au pairs (in partnership with their Host Families) are uniquely positioned to encourage the children in their charge. The list of yummies on the above page from Whole Foods includes “almonds, Brazil nuts, cashews, chestnuts, flax seeds, hazelnuts, hemp seeds, macadamia nuts, peanuts, pecans, pine nuts, pistaschios, pumpkin seeds, sesame seeds, sunflower seeds, and walnuts.” Then, these superfoods can be roasted with or without salt, eaten out of hand, or included in a variety of recipes. Preheat an oven or toaster oven to 350 degrees Fahrenheit. 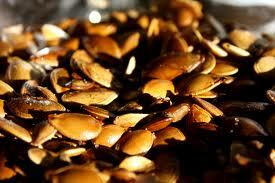 Place the pie tin in the oven and bake, stirring or shaking the seeds as they begin to brown. Some people like their pepitas golden brown—and others prefer just a bit of charcoal. The choice is yours! (Further resources for your pleasure: http://www.nuts.com, and http://www.nutsnberries.com).